Khater Restaurant must have made all its competitors crying in curry pots, as it serves extremely delectable Indian food and vegetarian dishes at very affordable rates in the district of Karama, Dubai. The interior of this restaurant also gives this place an edge over the rest of the eating places in Karama, as it has comfortable seating with dark blue cushions and squeaky clean surrounds. Its varieties like shami kebabs, chicken kalmi, barrah and etc are quite popular amongst the shoppers and locals of this area. Foodies can find this smart-looking restaurant near Karama Fish Market, where they can enjoy brunch, lunch and dinner from noon till midnight on any day of the week. Khater Restaurant is quite famous among the inhabitants of Al Karama because of its appetizing Indian and vegetarian dishes. The chefs use fresh ingredients to produce quality product, which can satisfy their customers. 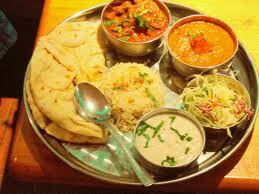 The top delicacies from its menu are shami kebabs, chicken kalmi, barrah or mutton chops and special dahl. Guests can have these dishes with hot and fresh rotis, which are baked in the oven. Facilities like outdoor seating and takeaway are also offered at this bistro, which makes this venue one of the most favourite spots for people. Between Saturday and Thursday this eatery serves lunch from 11:00 am to 3:00 pm and dinner orders are taken from 6:00 pm till midnight, whereas on Fridays this bistro opens for lunch between 2:00 pm and 3:00 pm while dinner is offered at its usual time 6:00 pm till midnight. Near Karama Fish Market, Karama - Dubai - United Arab Emirates. 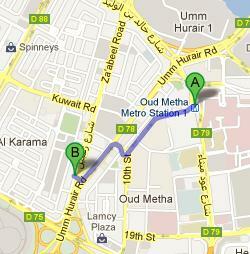 Head in the west course towards 10th Street from this metro station and continue straight onto 10th Street. At the roundabout, take the 4th exit onto Umm Hurair Road/D 78 and then take the pedestrian overpass in order to reach the destination. Al Karama Bus Station 1 - 45 B St – Dubai is 550 metres far from Khater Restaurant and by walk a person can get to it in about 7 minutes. All you need to do is to head in the southwest directions that go towards 45 B Street from this bus stop and then continue straight onto 45 B Street. Afterwards, turn left onto 20 B Street that will lead to a right turn, which goes onto 43 B Street, from where you should make a left turn in order to get to the destination. Bus number, which a person can use to reach this bus stop, is C3. See map for directions.